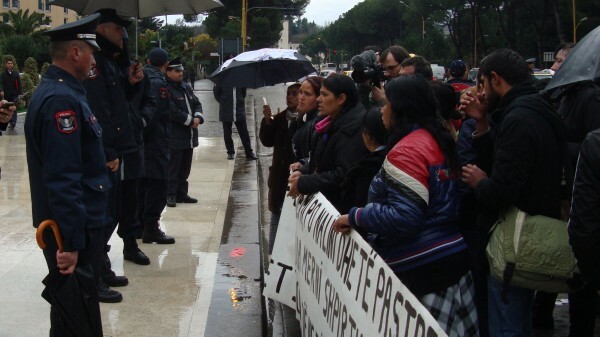 On 5 March, Civil Rights Defenders joined a protest aimed at preventing forced evictions and demolition of homes of about 70 Roma families in Selita, a district of the Albanian capital Tirana. The protest took place in front of the Prime Minister’s office in Tirana and is a part of the on-going “Right to Housing” campaign by Roma activists. The campaign includes public demonstrations, meetings with local and national politicians and officials, international organisations and foreign embassies. “These forced evictions will cause irreparable harm to the communities in Selita and affect the Roma community there. The Government continues to neglect its international obligations, just as it did five months ago,” said Vasilika Laci, Civil Rights Defenders’ Programme Officer for Albania. Civil Rights Defenders demands that the Albanian state authorities stop these forced evictions and work together with the representatives of the families to ensure that everyone affected are offered adequate alternative long-term housing. We further demand that the authorities in charge, such as the Ministry of Urban Development and Tourism, coordinates and carries out a plan of action to prevent forced evictions and ensure the affected families with adequate alternative housing. The Prime Minister’s Office reacted to the protest by encouraging the demonstrators to submit a letter to the state authorities. The families of Selita have announced they will continue their campaign until a long-term solution to their plight is found. The Albanian government has so far offered the affected families two years rent in compensation. The families have rejected this offer as inadequate reparation for the demolition of their homes and destruction of their neighbourhood and community. The families continue to live under daily threat of eviction. The right to privacy, family and home is stated in Article 17 of the International Covenant on Civil and Political Rights and in Article 8 of the European Convention on Human Rights. As a signatory of the International Covenant on Economic, Social and Cultural Rights, Albania is under obligation to recognize everyone’s right to an adequate standard of living, including adequate food, clothing and housing. The United Nations explicitly states that this includes protection from forced evictions.